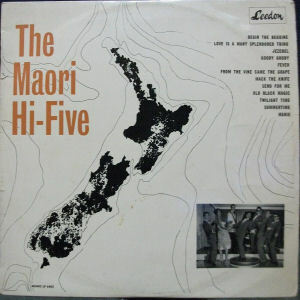 The Maori Hi Five were a Wellington based Maori rock and roll show band. They arrived in Wellington around the middle of 1955 and were soon at the forefront of the Capital's entertainment scene. They began the era of the Maori Showbands. They played such a wide range of music that they had an appeal to many. They played dance music, country music, Maori songs, musical hits, comedy skits and many other styles. There were a number of similar groups around at the time. Some included the Maori Hi-Liners and the Maori Troubadours. Their recorded output consisted of singles, "Oasis"/"American Patrol" on Rex in 1962, "Now Is The Hour"/"Putti Putti" on Vee Jay in 1962 and "Hippy Hippy Shake"/"Poi Poi" on HMV in 1963. They also released two EP's in 1963 and four albums. The first was "Instrumental International" in 1962. This was followed by "Serenade In Blue" and "Maori Hi-Five", both in 1963 and then "Mary and the Maoris" in 1969.